How old do you have to be to attend Cape Coral Technical College? Students must be at least 16 years of age before enrolling. High school students must have completed at least one year of high school. Do I need a high school diploma or GED to attend Cape Coral Technical College? No, you do not need a high school diploma or GED prior to attending Cape Coral Technical College with the exception of our Health Programs. Find out if you qualify for financial aid by contacting our Financial Aid office. 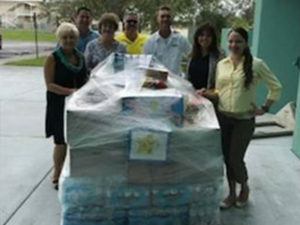 There is no cost for Lee County School District high school students. Please visit our Financial Aid page for detailed information. Does Cape Coral Technical College offer job placement? Our school counselor, administration, and instructors combine efforts to provide links between employers who wish to hire students and students who are actively seeking full- or part-time employment. Our class hours begin each weekday morning at 8:00 AM sharp and end at 2:30 PM. All students have a 30 minute lunch break. Health program hours may vary. Yes, there are attendance rules at Cape Coral Technical College. High School students who attend Cape Coral Technical College follow the attendance policy guidelines set forth by the Lee County School Board. Adult students are expected to be in class everyday except for emergencies. How can I receive technical career program information about the Cape Coral Technical College programs? You can receive detailed information about Cape Coral Technical College’s technical career programs in a number of ways. Printed brochures are available in the Cape Coral Technical College office for each program. Our School Counselor is available by appointment. All programs have web pages describing the program. These web pages contain e-mail links to the instructors for you to request more information or ask a question. Review our individual Programs. How do I enroll at Cape Coral Technical College? 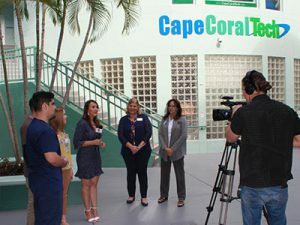 You can call (239) 574-4440, read about Getting Started, or visit our school Admissions Office in person for all the details on how to enroll at Cape Coral Technical College. How much does it cost to enroll in a program? For details on the cost of any program, please see the disclosure statement link at the bottom of each program page or see the Cost of Day Programs page on our web site. You may also call 574-4440 for current rates. What is the Wonderlic assessment and how do I register to take the Wonderlic assessment? The Wonderlic is a standard assessment used by technical/career schools across the state that tests levels in reading, math, and language skills. No other test can substitute for admission to Cape Coral Technical College. If a person has an associates or bachelors degree, he/she does not have to take the Wonderlic assessment. If you have further questions, please call 574-4440. How can I bring up my Wonderlic scores? You can enroll in Adult education at a cost of $30 per semester for Florida residents, $120 per semester for non-residents. Your test scores will be evaluated by one of our instructors and an individualized learning plan will be designed for you based on your Wonderlic results. Students work individually, at their own pace, and seek the assistance of an instructor when needed. Please make an appointment to register. Our instructors will provide you with a study plan based on your Wonderlic results. You will remediate and retest on one subject at a time. After you pass a practice test, you will be retested on that subject only. Then, you move on to the next subject. How long will it take me to bring my scores up? Since students work at their own pace, the length of time required for remediation varies. It depends on how many scores need to be upgraded and how motivated you are to bring your scores up. How often are remediation classes? Remediation calsses are held Tuesdays and Thursdays from 3pm – 5pm. When can I take the Wonderlic test? Please register in advance with our receptionist and pay the fee. Bring your receipt to the test with you. The fee to take the Wonderlic before December 21st, 2018 is $15, after that it will be $30. When can I come for Wonderlic testing? Do I have to bring anything with me to take the test? The testing fee, a picture ID and your social security number. What does the Wonderlic cover? How long does it take to take the Wonderlic?